If only I had a cup of coffee . . . Early last summer Murray began a cup painting, a shaped relief, and I was able to watch its growth. She began with a drawing, her usual method in these pieces. Drawings for Murray are “completely fun and easy and they roll right out of my mind”; many she scraps, but one that interests her she may develop into a relief, starting by enlarging it into a plan on tracing paper, at 1:1 scale and jotted with notes and inch marks. Turning this over to a studio assistant, she also gives him a clay model, only a few inches square but still a three-dimensional guide. Then she leaves him alone. Warren Kloner, maker of many of Murray’s stretchers and an artist himself, built this one according to his own usual method, cutting, carving, and layering sheets of pale—blond inch poplar plywood into the form of the artist’s desire. Some of the stretcher’s surfaces—the largest being the cup’s interior—are the plain wood sheet, broad and flat, just cut into a disk; others—the rim, the raised, commalike drop inside it, the handle at lower left, the thin crook-shaped tails that wander up and over from each corner—are carefully chiseled and rounded. I ask Kloner how many wooden elements make up the whole: “Lots,” he replies, then thinks: “A real lot. Hundreds.” (This is including the many bits and pieces that brace the invisible substructure.) 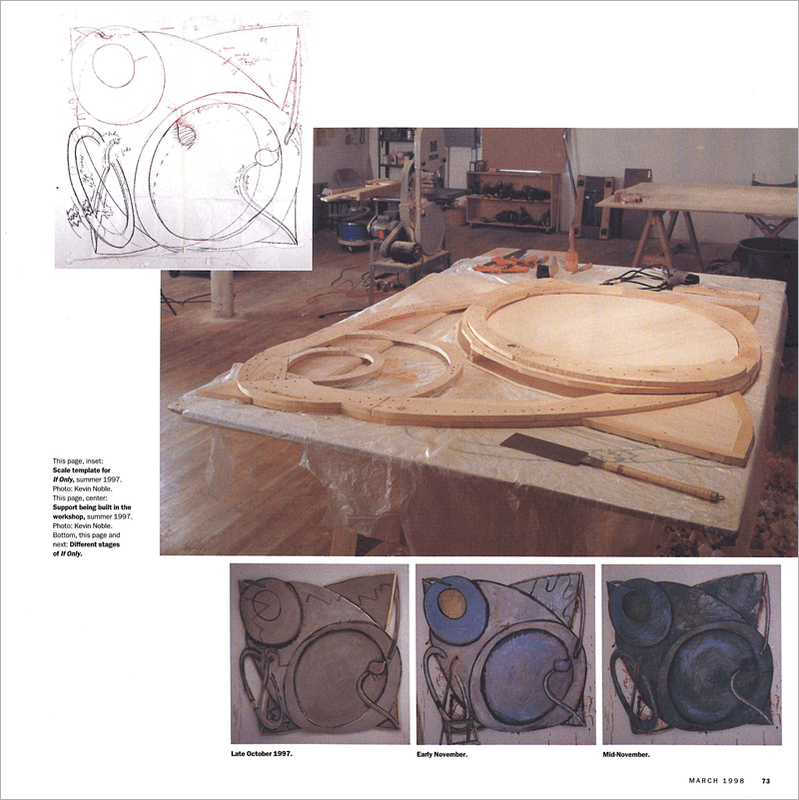 Whether flat or modeled, the pieces are worked and sanded at their edges to meld with their neighbors. Once the stretcher is finished—a six- to eight-week job—Kloner staples and glues down the canvas, which he has cut into pieces to fit the various contours. Inside the cup, where the largest single piece goes, he pours in “a lake of glue” and floats the fabric in it. “The glue shrinks the canvas a little,” he tells me, “so it tightens up.” The fragments of cloth don’t always join—they’re often bordered by narrow lines of bare ply. (Some of these, at the work’s outer extremities, will turn out to be the only parts from this stage still visible at the end.) Finally the whole surface is sized with the same rabbitskin glue, now mixed with gesso. At this point, had Murray told me this shaped monochrome was a finished artwork, I might have thought, Well, that’s a big coloristic departure, but it is certainly a handsome thing. Kloner has basically made a relief sculpture, in a solemn gray dusted with white. (Actually, even when the structure was still bare wood, I thought it was gorgeous, but it seemed tasteless to say so, since Murray had months of work to go on it.) Framed by arc-edged triangles pushing out from its diagonals, the object’s defining forms are two big ovals set akilter to each other, with an hourglass shape—the cup’s body—pressured between them. The larger oval is the hoop of the cup’s rim, its outer side a sloping shelf, its inner a deep overhang. The smaller one, with its incised circular scar, might be a saucer, but—presuming we are viewing the cup from more than one angle simultaneously, Cubist style—I imagine it as the vessel’s base. In the same way, I will later realize that the tails winding inward from the sides are table legs, as though the table (its corners being the four triangles) had flipped itself inside—out and upside—down to hold the upended cup in a fond but slightly sinister embrace, and also as though the cup were sitting both on top of the table and, given the legs curling around it, somehow beneath it. This gravitational doubt—falling/caught, over/under—is underlined by a moment at the lower left, in the cup’s C-shaped handle: a gnash of bare interlocking teeth, carefully carved by Kloner, that tells us the china is broken. Murray’s feelings being so mixed and contradictory, this is a sensitive phase, and I visit her only three times after the stretcher’s completion, in early September. (Once, when I propose stopping by, she says the piece is in a “kind of weird, tortured place right now,” and I should wait; only a couple of weeks later, though—this is in mid-December—she calls to say she’s practically finished.) She offers, however, to photograph the work regularly herself, something she has never done systematically before. These photographs track the experiments that would otherwise vanish with each change of heart, and looking them over, Murray seems to find them as interesting as I do, and even sometimes as surprising. The outlines of these shapes shift some, and through much of the painting’s story their color hovers through the violet and violent—pink scale. They start out, though, as blue, but then there is a time when the whole picture is shades of blue—the stage, I suspect, before it “feels like it has to start turning into something.” In mid—November the cup’s body has become a warm peach, its base related but cooler, its mouth a blue-to-purple, its rim and part of its handle soft gray. Later, I see in a slide that the body is black and the mouth a dull taupe, a reversal of the painting’s usual values of light and dark. This experiment doesn’t stay around long, though I think it’s quite beautiful. In fact several of the painting’s stages confront me with a more acute version of my reaction to the stretched but unpainted canvas: if Murray told me the work was finished, I would not know she was wrong. She would know she was wrong, but even she, apparently, wouldn’t always be quite sure why: of the peach-and-purple color scheme, she asks, “Why can't I just do this? This would be beautiful. And I can’t. But maybe I will. But right now I can’t.” She sounds a little upset. I am surprised, then, to see the painting one more time, in early January. The changes that Murray says complete it are not enormous, but they are distinct: a darker green for the corners; a sideways twist for the disk inside the upper-left oval, and also a brighter yellow, picked up in a stronger yellow halo around the cup’s inner rim; slight tucks in the visibility of the bare-wood edges. It definitely looks finished—this cracked cup has become a vessel in whose security one becomes invested—and plans are made to photograph it. Then, as I’m working on this essay, the shots arrive, and I am frightened to see that they show Elizabeth readdressing the painting, brush in hand. If only—but then that, after all, is the work’s title: If Only, 1997-98.